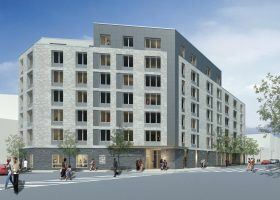 A South Bronx mixed-use development, dubbed the Thomas and Lilly Keller Manor, launched a housing lottery this week for 65 affordable units. Designed by Heritage Architecture, TLK Manor features two six-story buildings in Morrisania: 917 Westchester Avenue and 944 Rogers Place. The two buildings boast a unified design, seamlessly blending into one another. Qualifying New Yorkers earning 60 percent of the area median income can apply for units ranging from a $860/month studio to a $1,281/month three-bedroom.